As I promised in this post sharing some staples I love to splurge on, I also wanted to share a roundup of wardrobe essentials you can easily snag for $100 or less (in some cases, much less!). Several of which I’m wearing in this outfit! I hope you guys enjoy this curated roundup of basics under $100 in each category – don’t forget, you can click on the arrows of each widget below to reveal even more finds! My longtime followers will groan at me for repeating myself for the millionth time, but I cannot live without a neutral trench! I wear mine all. the. time. I style them with lace-trim camis for dates, a tee and jeans for travel, a black dress for meetings, and so many other combos you’d be shocked. Most of my trenches are in the $300-$400 range from Club Monaco (I have five now – I know, I’m nuts), but I also own some more expensive (Burberry, A.L.C., Timo Weiland) and less expensive (Topshop, ASOS, Zara) styles. Trust me when I say a neutral trench coat is my absolute favorite work-to-weekend-to-travel staple. Whether you choose a classic trench style or a drape-neck look, they add instant polish to any outfit. 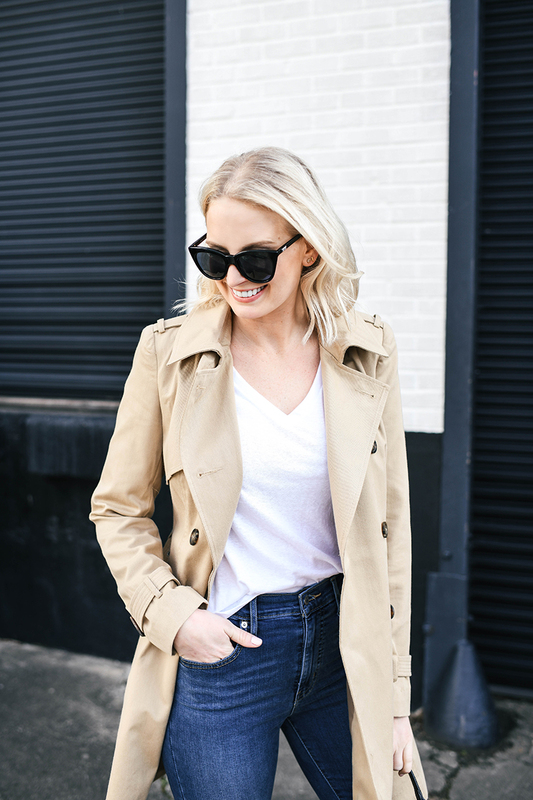 Shop some of my favorite trench styles under $100 below! 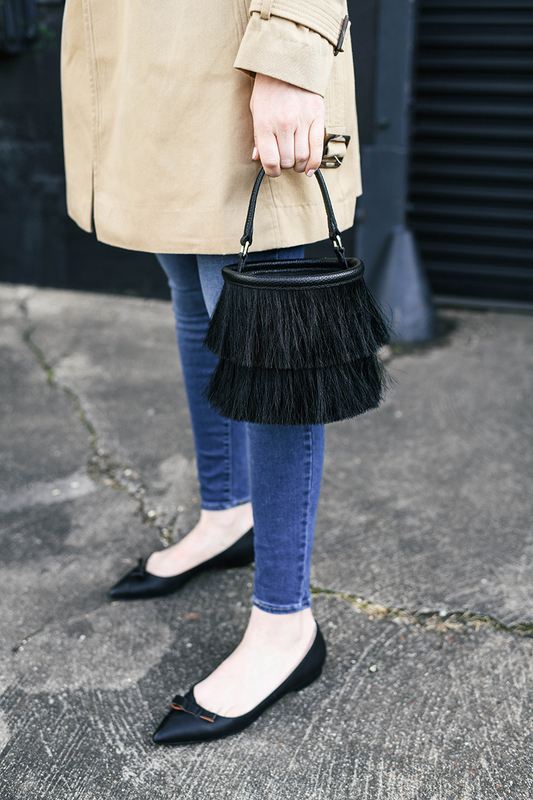 Hear me out… I know I said investing in classic skinny jeans is totally worth it in this post! BUT, you can also snag some great styles for less too. Certain brands like Topshop just don’t fit me well, but I really, really love LEVI’S. I recently picked up this mile-high super skinny and am so impressed with the quality, fit and fabric. I wore them all last week and over the weekend in Atlanta! The rise is higher than any pair I have in my closet, so they look great with my new bodysuit (no muffin top situations over here). As you can see in the photos above, they are skinny all the way to the ankle – perfect for stylish with flats, mules and pumps, but also ideal for tucking into even the tightest-fitting boots like my leather Lowlands I took to Atlanta. Shop my exact jeans here and more under $100 styles to love below! Another item I love to invest in is sunglasses, but you can EASILY find stylish specs for under $100! My favorite black Celine sunglasses have a scratch on the lens (saddd! ), so I’ve been needing to find a new pair to wear while I procrastinate getting those fixed. I found these during my last Shopbop haul and think they are a such a flattering shape for my face. They’re classic, simple and just a great pair for everyday wear. Shop my sunglasses here and more sophisticated under $100 sunnies below! These are definitely staple pieces! Love your trench coat! Love this pots! I confess to owning multiple Club Monaco trenches myself… they’re so cute! I also have a cheaper one from ASOS in a different shade of tan. Also I want your shoes!!! Going to have to check out some of this denim. You make basics look glamorous! Love these on you!